At Forward Footsteps, authors Dr. Stacey Bromberg and Dr. Joe Taravella extend this important message to include the notion that in order for every child to experience someone who is “crazy” about him or her, so too must the caregivers who care for our children. Forward Footsteps holds its mission in mind with an emphasis on young child and caregivers, and a vow to promote a world with opportunity for support, encouragement, relevance, and respect for all families. 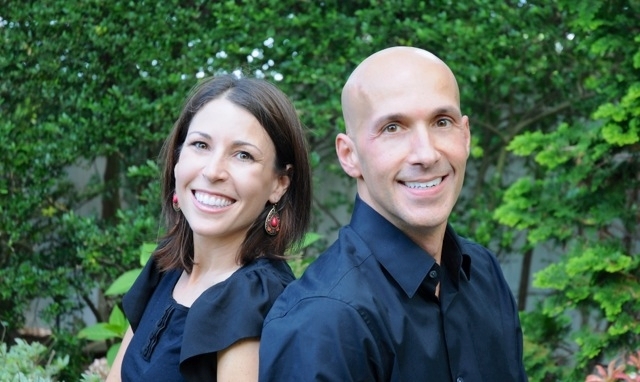 Dr. Stacey and Dr. Joe are both licensed clinical psychologists that have been helping children and families realize their greater potential for almost two decades. Together they received their masters’ and doctorate degrees with a specialization in Marital and Family Therapy, and subsequently ventured into additional areas of specialization in their career paths. Though separated by miles, they have been in constant collaboration with an emphasis on the same goal: to help others achieve their best, with focused attention on the importance of investing in and valuing our youngest members of society, our children, and those who care for them. After years of professional interaction and personal work together, they began to formulate ideas to develop a publishing company based on their work with individuals, children, and families, and influenced by their own families and parenting experiences. Inspired by the thousands of children and families they learned from as practicing psychologists, Dr. Stacey and Dr. Joe envisioned reaching a broader spectrum of families to partner in facilitating overall well-being and growth, and have done so by creating Forward Footsteps, LLC. 10 years. As a licensed psychologist in the state of Colorado, she provides clinical services and consultation to children and families, with specialized experience in the areas of grief and loss, the perinatal period (pre-pregnancy, pregnancy, and the early postpartum period), and parent-infant relationships. Dr. Stacey also provides reflective supervision and consultation to professionals seeking a deeper understanding of their work experiences with children and families and support around caregiver burnout and compassion fatigue. Consultation to programs and/or agencies is also within the scope of her work, with an emphasis on programming and staff development. Dr. Stacey’s formal training is in Clinical Psychology, with certificates in Marital and Family Therapy and specialized training in Clinical Child Psychology and Infant Mental Health. She received her Bachelor’s Degree in Psychology with a certificate in the Neurosciences from Duke University, and went on to receive her Master’s Degree and Ph.D. in Clinical Psychology from St. John’s University in New York. Following completion of her doctoral degree, Dr. Stacey moved to Colorado where she completed a fellowship in Infant Mental Health through the Harris Program in Child Development and Infant Mental Health at the University of Colorado’s School of Medicine. In addition to her community-based private practice, Dr. Stacey serves as an Assistant Clinical Professor in the Psychiatry Department at the University of Colorado Denver. She is the Director of Fussy Baby Network Colorado, a program modeled after the national program at the Erikson Institute in Chicago centered on prevention and intervention for families struggling with issues of infant crying in the first year of life. As part of her faculty role within the Harris Program in Infant Mental Health and Child Development at the University, Dr. Stacey teaches a course on Perinatal Mental Health and Pregnancy Loss and is a supervising psychologist for postdoctoral fellows. Dr. Stacey is also the Past President of the Colorado Association for Infant Mental Health, (CoAIMH), former Director of Infant Mental Health Programming at the Haven Mother’s House, a residential therapeutic treatment community for pregnant and parenting women struggling with drug addiction, and serves on several councils and committees to inform policy and service delivery efforts targeting very young children and their families. Additionally, Dr. Stacey provides consultation to several national programs, and collaborates locally with Colorado Pregnancy and Newborn Loss Services (CPNL), a non-profit organization that provides comprehensive support and services to families grieving the loss of a baby. Visit Dr. Stacey's website at www.drstacey.net. Dr. Joe Taravella is a licensed clinical psychologist in New York and New Jersey and serves as the Director of Psychological Services at Moretti and Racco Medical Associates in Staten Island, New York, where he provides psychological consultation and treatment to patients within a comprehensive medical setting. In addition to his private practices in Manhattan and New Jersey, Dr. Joe is proud to serve as the Director of Family Programs as a member of the Board of Directors for Kid Angel Foundation, a non-profit organization that helps underserved children and families from distressed communities move toward positive social and economic mobility. Dr. Joe’s clinical work is based in cognitive-behavioral psychotherapy with psychodynamic theory, assisting clients with a variety of congenital, emotional, and traumatic disorders. His expertise lies in identifying and treating the neurological, behavioral, and environmental problems that cause the breakdown in a family, including children falling behind in school. Dr. Joe has been instrumental in getting families to achieve breakthroughs by revealing secrets in a safe and effective manner, and has created Dr. Joe’s Secret Box®, a therapeutic tool used to help individuals and families in crisis. Dr. Joe received his Master’s Degree in General-Experimental Psychology, and then earned his Master’s Degree and Ph.D. in Clinical Psychology with a specialization in Marital and Family Therapy at St. John’s University in New York. He received his clinical training at Bellevue Hospital and New York University-Langone Medical Centers in New York City. Resident, and a Staff Psychologist in the Adult and Pediatric Psychology Departments at NYU-Langone Rusk Institute of Rehabilitation Medicine, with a focus in rehabilitation, neuropsychology, and family systems. Dr. Joe also completed a Pediatric Neuropsychological Fellowship at the Rusk Institute working as part of a comprehensive team in both inpatient and outpatient settings, conducting neuropsychological evaluations and therapeutic treatments for children with a variety of congenital disabilities, traumatic brain injuries, as well as psychological and psychiatric disorders. Dr. Joe has worked with Dateline NBC and MSNBC, and he was recently chosen by the show’s creator to be the host of a reality-based television series helping children and families in crisis. This reality series is currently being pitched to networks. Dr. Joe’s interview on cyberbullying was nominated for a 2012 Eddy Award, and he was among the top 25 candidates selected for the Live! With Kelly Coast-to-Coast co-Host Search.